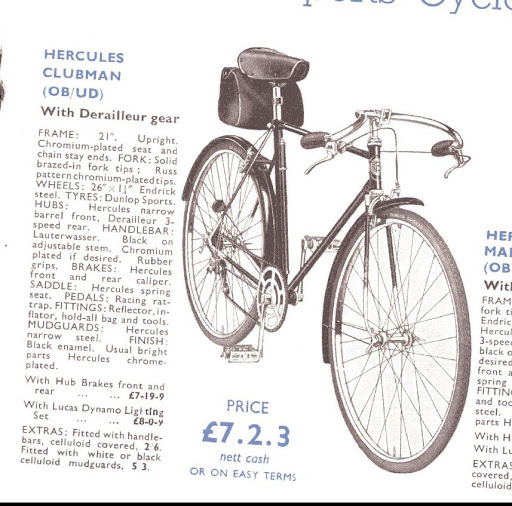 I have just bought this Hercules bicycle for a pretty reasonably price. It looks to be complete and it should clean up pretty well. I think it's from the 1930's and I'm guessing it's something like the Hercules equivalent of a 30's Raleigh Record ace by looking at the swan neck stem and saddle pillar. I'm guessing that it was one of the real top of the range bikes of the era by looking at some of the components. Can anybody help with a rough age or exact model? Another one! Lovely look to it, quite different from the Rudge with this Herc having gears and the stem, seat post so different. Looks to have green paint on it? lots to work with , lot of work. Sorry, beyond my knowledge to pinpoint a date or model. fender clip is off the stay bridge so no stress there on getting the fragile fenders off. Is the badge really rusted or is that the head tube with a hole in it? Can't tell. Yeah its the original green paint. Very unusual as most bikes of this era were all black. And to be fair there isnt too much work. It just needs to be taken apart, have all the parts cleaned then put it back together and replace the tyres, tubes and bearings. It's a real shame that one of the grips is missing because that will be near impossible to replace. The other one however is original and in excellent condition. Even has all the original cables in working order too. As for the badge im not sure whats going on there but I hope the head tube isn't rusting though. I thought it was neat seeing the 1899 Schwinn Catalog- that Black and Brewster Green were THE paint options. Lycett saddle looks like a Gentlemans 99n which was around the 40's through 50's. Have not seen another badge yet. That would be a real date stamper. Oh I was only referring to British bikes of the era. Over here most bikes in the 30's were black, apart from the real fancy expensive ones. Might of been a different story in America though. I'm now 100% sure the bike is from the 30's after having a look over it. And yeah im slighly suspicious of the saddle and think it may be of a later date as I don't think the 30's ones had that type of badge. I think you are correct- in both the US and the UK. I recall seeing some red bikes- but I have no idea if those were personally custom modified. Although it's not exactly related, the saying about the Model T was: "Any customer can have a car painted any colour that he wants so long as it is black." The closest reference I could find to 1930s Hercules is this 1940 poster. The closest bicycle to yours is the Model "O" Racer. But your bicycle looks older, as you have noted. Quite a relic... best wishes for the restoration! I suggest that it has been upgraded over time. saddle, chainset, brakes, gears. the 1934 "E" Club model has the swan neck stem. check the spec's of that against the components on yours. The best identifying feature may be the positioning of the mudguard braze ons. I would concentrate on that feature. can you give post photos of the brake calipers? and what is the wheel size? is there any stampings on the chainring? Thanks for all the great information! When I get round to cleaning it all up I will get pictures of the brake calipers and look on the chainring. Some of the 30's catalogs are missing from the Veteran Cycle Club. As I cant find my bike in any of them my guess is that my bike might be from one of the missing years? Which are 1932, 1933, 1936 and 1939. My bike has green paint, a 23'' frame and full chrome forks. I can't find any frames even close to that? Most of the similar ones in the catalogs were only made with 21'' frames and half chrome forks. "can you give post photos of the brake calipers? and what is the wheel size?" Very nice! I agree with the 1930's date, but I don't see any details that would narrow it down. I agree the derailleur and saddle are later (mid to late 50's). The plain lugs with elliptical holes are typical of lower range Hercules bikes as late as the 50's but the headclip stem and curved seat post are earlier. check through the available catalogues to see when the wheel sizes changed from 26" to 27". That gives you the end date. then work though the previous years to see if there were any start or end dates to using the mudguard mounts in the locations you have. Chrome plated forks were an option as set out in the catalogues. The green paint near the gear lever suggests it was green polychromatic. This was not mentioned in the paint styles for the sample catalogues I looked at, so I am suggesting it is a respray. If you remove the forks, is there any evidence of an earlier colour? Is there any serial number on the frame or headtube of the forks? What I would do is contact the V-CC Marque Enthusiast for Hercules and ask. But then I am able because I am a member of the V-CC. Last edited by Big Block; 02-20-16 at 02:03 PM. Yeah, fair enough, but keep that stem and handlebar! And maybe the seat post. Those things are really hard to find. I like it Great find, I don't expect the handlebars to come from a tandem tho... They usually had a larger diameter steerer tube in the thirties. Depending on where you are located in the UK, pls let me know if and when you are putting it on the market. I love pre-50s bikes, but unfortunately they tend to be too small (20") for my 5ft11in. I have a question about the Pathfinder as well - I found a rustbucket a while ago, sporting 26 x 1 1/4 FM (alloy hub - 50-10) wheels and Rudge features. I couldn't find any fitting decals underneath all the hammerite and layers of paint. Altho Rudge was owned by Raleigh back then, they didn't follow the Raleigh serial numbers. Also it has a 25.4mm alloy seatpost and you can feel a sleeve in the seat tube. Probably 531PG. It doesn't have the windowed lugs. Can you tell me if you have a 25.4 seatpost as well? Did you manage to pinpoint the year of manufacture? Mine has the frame number on the seat lug: 241289 with a "R" underneath, how does that compare to yours. All the Raleighs I've seen from that era had the 25.4 mm seat post, including the 531 ones. @rhm for the love of standardisation Probably all the Raleighs (and derivatives) from that era had the same dropouts and octagonal headsets as well. I attach a picture from one of the decals I found on the Rudge, maybe someone here knows what it is. I expect it to be a Pathfinder, but the decals and lugs (no windows) made me doubt. I also love pre 50's British racing bike and your quite right, they are never big enough! I'm 6ft2in! Although if you get the 23'' frames and adjust the seat post and stems then they are just big enough. As for your Rudge I would suggest that it is either a pathfinder or an Ulster Sports. The Ulster Sports is the Rudge version of the Raleigh Trent Sports and both were on the lower end of the scale of racers they made in that era. The ulster Sports is very rare, much rarer than any Lenton or Clubman. In fact the only one I have ever seen is the one I used to own which I now very much regret selling! My Pathfinder has a 25.4 seat post I think. And yes I know the date of mine, it's 1952. The serial number on mine is 307239 R underneath. @shadaboot28 thanks for sharing your thoughts. Lovely Ulster, there is one on eBay now - a 21"
Based on your frame number and the 50-10 marking on the alloy FM hub I would think mine is a late 1950. I had a good look at the 1949 Pathfinder, and although the lugs match the guide wheel for the SA gear cable is not brazed on. The 1951 model has the windowed lugs. I cannot find any pictures from a 1950 Pathfinder, but looking at the 1950 Lenton seems to be a match with mine. Lugs match and they have a braze on for the guide wheel. Afaik the chainset on mine is original and the Ulster Sports came standard with the "Hand" chainring. Purely based on the chainset, I would think mine is a Pathfinder. Purely looking at the frame it could be both - question is how to confirm it is 531/PG tubing or 2030 steel? If seatpost is standard 25.4mm, would you feel a sleeve in the seattube with 2030 steel? So sorry to change this thread from a very cool Hercules to questions about a Pathfinder/Ulster Sports.